Jewel and her mother, Lenedra, stopped by San Dieguitos High School in Encinitas, California on April 15th to speak and perform "I'm Sensitive." Java Joes featured another Jewel interrupted Rugburn set, Friday April 11th. Jewel was the recipient of the Best New Female Artist Award in the 3rd Blockbuster Entertainment Awards. It's not a Grammy, but at least Milli Vanilli hasn't won one. Jewel, accompanied by Steve Poltz, sang "You Were Meant For Me" on Leno. Also appearing, to round out a great show, Howard Stern and James Carville. They talked it up on March 3rd as only Charlie Rose can, plus a live "Emily" performance. A little chat? MTV's Arena Chat on March 10th happened right on schedule. Jewel was prompt, polite, articulate as ever and the most fun you'll have on AOL & MTV. Check out the transcript. Near Miss: An encore of another "best new artist" award didn't happen Grammy night and the "experts" were stumped as a 14 yr old Rimes beat up 9 yr old No Doubt, took out the Garbage and demolished the Tony Rich Project. In the other Jewel nominated category, Best Female Pop, Grammy sweetheart Toni Braxtons' heart was unbroken. Paired with Kevin Spacey (Usual Suspects, Seven), Jewel awarded the Smashing Pumpkins with the Hard Rock Performance Grammaphone. When asked about the near see through dress, "It's hard to realize that these things go out to millions of people," she said. "Tomorrow I'll be saying, `What was I thinking?'" Details & pics - the Jewel-Grammy source. 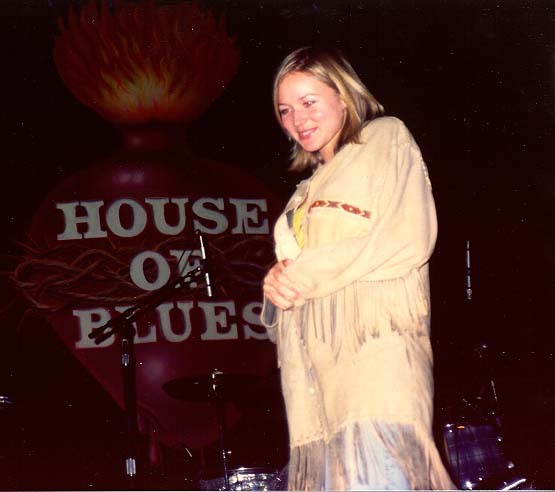 Jewel crashed another Rugburns set at the House of Blues in West Hollywood on Feb 5. Bob Scott sent two shots, one & two (32k, 27k). Jewel hosted MTV's Grammy Guide, from Steve Poltz' home who dropped by in the same puffy shirt he wore in the YWMFM video. Pics and more are here.